A common Indian, specifically Moghal, technique is to cook a lot of onions separately and add them to a curry dish during the last few minutes of cooking. This has the effect of substantially altering the taste and consistency of the dish…the end product is something of a surprise to the diligent cook who has tasted at every stage. 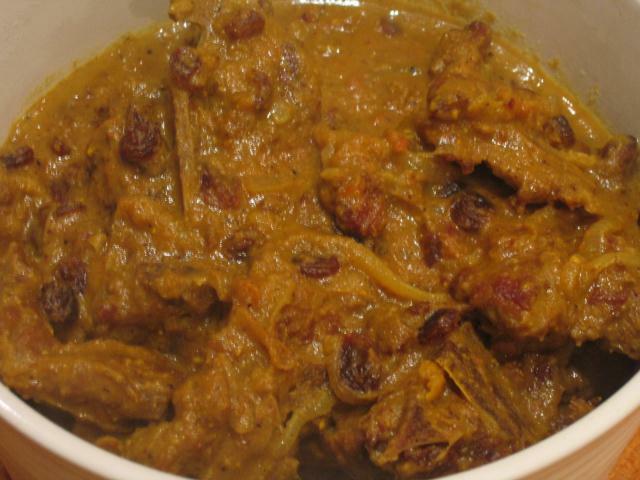 This is one such example – a simple lamb curry that explodes into life in the last five minutes through the addition of sweet onions and raisins. Quickly brown 1.5kg of cubed lamb shoulder in hot oil. Brown just a few pieces at a time to prevent the meat steaming in it’s own juices. Meanwhile, coarsely chop two onions, five cloves of garlic and a 5cm long by 2.5cm wide chunk of peeled ginger in a blender. A little water will be needed to produce a smooth paste. Pour the onion paste into the empty meat pan and cook over a medium heat, stirring and scraping constantly. Make sure everything that became welded to the bottom of the pan during the browning process is incorporated into the onions. Add one tablespoon of ground coriander, two teaspoons of ground cumin and a teaspoon of turmeric and fry for a little longer before adding three heaped tablespoons of yoghurt, a spoon at a time, stirring throughout. Next add a peeled and chopped tomato (one from a can will be just fine). Keep frying, stirring and scraping. The onions will need about ten minutes in total and will turn a deep golden colour. Tip the browned meat and all it’s juices back into the pan, with one and a half teaspoons of salt and half a teaspoon each of ground cloves, nutmeg and cinnamon. Add a small amount of cayenne pepper, maybe about a quarter of a teaspoon, or as much as you dare. A good few turns of the pepper mill will also help. Top the meat up with some water, maybe half a pint or so and let simmer for at least an hour. Slice a ridiculous number of onions, at least five or six and fry them in oil in a large pan. The onions need to be browned, but not crisp. This will take at least ten minutes. After an hour, check to see if the lamb is tender, and if it is, add the fried onions and two or three tablespoons of raisins or sultanas and let the curry simmer for another five minutes. You may need to quickly reduce the curry over a high heat before adding the onions and raisins, if there seems to be too much liquid. Serve with plain rice and any type of Indian bread.